Welcome to Cape Noire. Located on the Northwest Coast, Cape Noire is a booming economic giant whose inner core has been corrupted by all manner of evil. From the sadistic mob bosses who ruthlessly control vast criminal empires to the fiendish creatures that haunt its maze of back alleys, Cape Noire is a modern Babylon of sin and depravity. Amidst this den of iniquity strides a macabre warrior committed to avenging the innocent and holding back the tide of villainy. He is Brother Bones, the Undead Avenger and there is no other like him. A one time, heartless killer, he is now the spirit of vengeance trapped in an undying body. He is the unrelenting sword of justice as meted about by his twin .45 automatics. His face, hidden forever behind an ivory white skull mask, is the entrance to madness for those unfortunate enough to behold it. This new collection features five suspenseful, fast-paced, action packed stories featuring pulp fiction's most original hero, Brother Bones. Time to draw the shades, light the candles and enter into a Tapestry of Blood. Brother Bones is a blast from the past that doesn't feel dated, but still carries that noirish charm of the thirties. This is done in the same vein as the Shadow, Green Lama, and Doc Savage. It fits right in with those iconic characters, and if you didn't know better you would believe that it really was an OTR program at one time, or had dozens of pulp novels being sold in stores. A killer who is cursed by his victim, Bones is doomed to act as a spirit of vengeance upon the killers of the innocent. A similar concept to the early DC Spectre or Marvel's Ghost Rider. He also gets a spirit guide to lead him to targets. This is a collection of several short stories, furthering the feel of Old Time Radio. Here he faces opponents of flesh and blood, then not so much, and undead as well. Each tale is great, and is better than the last. Best of all, we get to meet another new pulp heroine, th Pulptress. Anyone who is a fan of noir era tales, OTR, superheroes, or even paranormal will enjoy this new series. BTW, Bennet really sets a tone with his reading, think Orson Wells as the Shadow. He does a fantastic job, and when you hear his voice as Brother Bones you will get as shiver of excitement. "Bad Guys Beware, There's a New Nightmare in Town"
Brother Bones has a way of creeping up on you, but instead of being scared, you are rooting for his special kind of justice. Evil can run, but it can't hide from Brother Bones. Totally, Brother Bones is a great character. Yes, and as ever he is terrific on this book. Actually kept me in suspense. I felt sorry for some of the characters trapped in their own problems. Hope Scott gets to do lots more Brother Bones books. Brother Bones was a ruthless killer in life. One of his innocent victims cursed him. His total existence now consists of sitting in a dark room, waiting for her ghost to appear and call him to action. He can never truly die and must avenge the innocent victims of killers like himself. There is a strong pulp fiction feel to the stories. The bad guys are sometimes human, sometimes non-human, with a strong presence of the supernatural. There are really two stories in "Tapestry of Blood." The first involves "The Butcher," a psychotic serial killer. The second is "The Bruiser from Bavaria," a psychic vampire. We are also introduced to the Pulptress, a bounty hunter who is after the same killer that Brother Bones is after. I enjoy Ron Fortier's stories. They're great fun! I received a free copy of this audiobook from AudiobookBoom in exchange for an honest review. For more! I was voluntarily provided this free review copy audiobook by the author, narrator, or publisher. I love the BROTHER BONES series and I think The Tapestry of Blood is the best one thus far. I didn't want it to end. The undead of Cape Noire are strong, full bodied characters that you can't help but like with the exception of the baddies that dare to enter. My favorite character is Paula and her new persona as well as the teenage girl she saved named Nancy Hanson. What I enjoy about the series is that with each installment the main players evolve into more greatness and the introduction of new characters within each story is very clever. For example, I love the Bruiser from Bavaria and The Plastic Army created by Mott Smalley. Pure genius. Ron Fortier is a fantastic author. J. Scott Bennett's performance is SO GOOD. He's an excellent voice actor with perfect inflections, tone, and character voices. He adds just the right touch. This pair up of author/reader is by far one of my favorites. Recommended and especially if one dares to enter Cape Noire after dark where dead men don't sleep or dream. Audiobook gifted for my honest review. I never thought I would be a fan of this genre (is it pulp fiction? ), and yet I have immensely enjoyed each book I have listened to in the Brother Bones series. It combines gritty crime, a supernatural avenger, interesting characters, and a great story. I listened to the Audible audio version narrated by J. Scott Bennett, and his narration is great. I actively search out books that he narrates, and I have never once been disappointed with his performance. I'm looking forward to any future books in this series. If you like noir, crime fiction, or tales of vengeance, I highly recommend this book. If you could sum up Brother Bones: Tapestry of Blood in three words, what would they be? What was one of the most memorable moments of Brother Bones: Tapestry of Blood? To me, what's most memorable is Ron Fortier's creation, vigilante Brother Bone, placed into familiar Noir settings. Tapestry of Blood is a collection of work that combines adventure, fantastical characters of the underworld interacting with gangsters, and the every day people of a city filled with corruption and dog eat dog survival. It makes for an entertaining listen! Yes! A half dozen or more of his work. I actually look for audio books he works on. I enjoy his abilities, he is versatile in voice characterizations, with a great sense of pace, and dramatic ability. He has set a standard that listeners can appreciate. This is no exception! Vigilante, death dealing, Undead... "Cape Noire ain't worth a cup of vampire ...[urine]...", apologies to Clint Eastwood's Preacher in "Pale Rider". 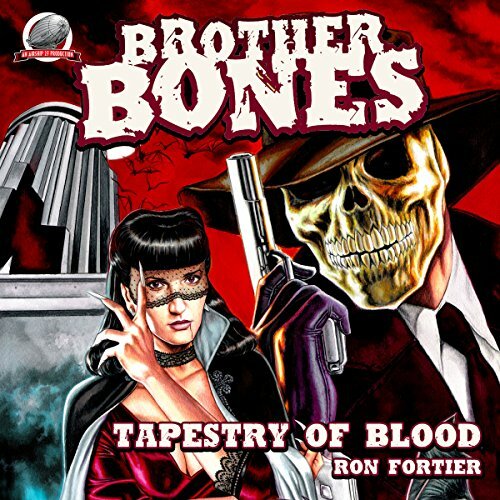 Brother Bone is Ron Fortier's creation that other writers have branched the story from. The most familiar example for me is the "Thieves' World" collections. Robert Asprin, Lynn Abbey, Janet Morris, et al. I enjoy the idea. Thank you for the opportunity to listen to and review "Tapestry of Blood. Highly recommended! Although the narration was strong in this story, some of the stories were a bit bizarre and not to my liking. However, some of the stories were entertaining. These stories kept me listening. "Ha, ha, ha. Nothing can save me now." J.Scott Bennett's interpretative performance brings the whole world to life, giving just enough sinister undertone to his reading to embue a tension without distracting from the comedy. Good, riotous fun with just the right touch of evil. This is the second Brother Bones book I have heard and, although not quite as enthralling as it's predecessor, it was a thoroughly enjoyable listen. Recommended. My thanks to the right's holder for gifting me a copy of Tapestry of Blood.